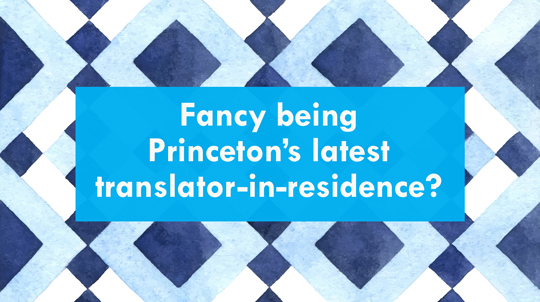 Apply to Be Princeton’s Latest Translator-in-Residence! Applications are invited for up to one semester in spring of 2018 for a position as Translator in Residence at the Princeton Institute for International and Regional Studies (PIIRS). Candidates should be established translators into English with a project currently in progress that would benefit from the support offered by Princeton. Applications will be reviewed starting on December 1, 2017, notification will likely occur by December 15, 2017. The successful candidate will contribute to the teaching of theory and practice of translation. Responsibilities will include participation in the courses offered by the Program in Translation and Intercultural Communication and the Program in Creative Writing and mentoring undergraduate student translators. Candidates should be established translators into English with a project currently in progress that would benefit from the support offered by Princeton. The person appointed will reside in or near Princeton for the duration of their appointment and will have office space on campus. Be advised that you will be contacted only if there is further interest in your application. The candidate dashboard will not display status updates for this requisition.